Are you looking for inspiration for a baby quilt for a new little man in your life? If so you're sure to find something here. You're sure to find something you'll love in this collection of unique baby quilts. You'll find lots of free baby quilt patterns on the Quilting Web site, and most are suitable for quilters of every skill level. Continue to 2 of 80 below. From Angela: My grandson loves his Pap Pap's green truck, so I made a quilt with truck applique on the back. He loves it. Continue to 3 of 80 below. From Char: I made the Choo-Choo Train baby quilt for my grandson and embroidered his name and birth date in one of the squares to personalize it as a keepsake. Continue to 4 of 80 below. From Sheilago: I made a quilt like this for an Irish cousin's baby. The Irish chain design seemed appropriate for an Irish baby's first quilt. The teddies were inspired by a peek a boo quilt I saw on this site. All the plain squares are hand quilted with stars and moons, which will hopefully make the baby feel sleepy! Continue to 5 of 80 below. From Georgia: I created the Tonka Toys quilt for my first grandson. I fussy cut all of the different trucks in 6-inch squares, then pieced them back together, added the border from fat quarter scraps, and included a striped backing to match. The quilt measures 55" x 43" and I think it is my best ever. Continue to 6 of 80 below. 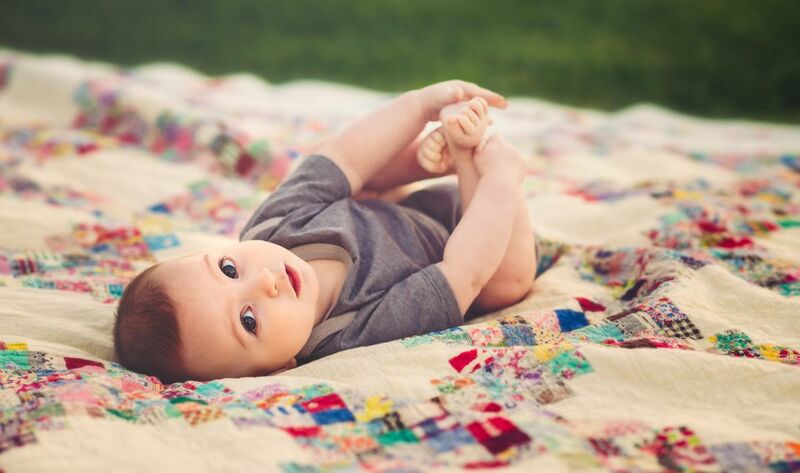 From Alice: This quilt was for my first grandchild, Aiden, and needed to be special. I cross-stitched all the blocks before I assembled the quilt -- it's bigger than the crib! I also messed up and put the "ice cream" block in upside down. The quilt is still holding up strong, four years later. Note from Janet: The ice cream block looks perfectly-on-purpose sewn upside down. Continue to 7 of 80 below. MNQuilter: Upon learning that my husband and I were to become first-time grandparents, I started searching for fun baby quilt patterns. Because our son and daughter-in-law did not plan to find out whether they were having a boy or a girl in advance of the baby's birth, I had to find something that worked for either gender. I discovered a darling quilt made of appliqued "critters" with embroidered facial features and other cute embroidered details. Our daughter-in-law was planning to decorate their nursery in non-traditional colors, not the standard baby pastels. So I decided to go with fun, bright colors, and patterns. With a white background in the appliqued squares, the "critters" really stand out. I had not done prairie points before, but loved the look and decided to add them to the bound edge. Continue to 8 of 80 below. From BJ: My daughter-in-law wanted a non-traditional baby quilt in shades of green. I designed this quilt myself and put black in it to attract my grandson Malcolm's eyes. Continue to 9 of 80 below. Kitty says: I made little pillows with these faces and donated them to the Ronald McDonald House. Then I got the idea to make a quilt using the same faces. The one on the bottom left-hand corner is a drawing my grandson drew of himself when he was missing his teeth, which made a cute filler for my extra square. Continue to 10 of 80 below. From Bonnie: I needed a fast baby gift, so I relied upon the cute pattern printed on these fabrics to create a baby quilt. Continue to 11 of 80 below. From Bonnie: I made this little quilt for a new baby boy, fussy cutting the Pooh fabric to feature the different scenes of Pooh and his friends. The squares are framed with color coordinating fabrics. Continue to 12 of 80 below. From Bonnie:: This 30" x 30" baby quilt was made using the traditional Snowball quilt block sewn next to nine-patch blocks. The quilt was a gift for new parents. Each Snowball block has a child-related scripture printed on it. Continue to 13 of 80 below. From Angela: I made this twin-sized quilt for my grandson. It was designed around a purchased panel and I made a matching pillowcase to go with it. My grandson absolutely loves it. Continue to 14 of 80 below. Susansquilts says: I made this quilt for a co-worker for her baby shower. It is 100% cotton, hand-tied with a flannel Winnie the Pooh design on the backing as well as the front. It was very fun to do and she loved it. Continue to 15 of 80 below. Tiny Trip Around the World Quilt. Quilt by Jeanne J.
Jeanne says: I made this for my niece's first baby. They live so far away it feels like we have to travel around the world to see them! Continue to 16 of 80 below. This quilt is perfect for any future Spiderman fan! Continue to 17 of 80 below. Baby Carriage Quilt. Baby Carriage Quilt by Karen L.
From Karen: I designed the quilt after my niece's shower invitation. The baby carriage is done in applique and the blue hood is slightly stuffed to give dimension. Continue to 18 of 80 below. From Cathartes: I saw this bug jar quilt and as​ a beginner, I thought I could handle this pattern. What a perfect thing to make for my first grandson! The finished quilt is only 36" by 48" just the right size for a toddler to drag around and cuddle. I did the smaller jar pattern, chose fun items to put in the jars and made pairs so as he gets older, he can play at matching them up. Continue to 19 of 80 below. From Julie: This quilt was made for a charity I quilt with called Quilts for Kids. I like this quilt because it's fun and uplifting. I hope the child who gets it feels that way, too. Continue to 20 of 80 below. This quilt combines pinwheels with embroidered dragons perfect for any fan of fantasy! Continue to 21 of 80 below. From Maria: This is a simple baby quilt that I had to make fast to give as a present. It was sewn from panels and worked nicely for a nice quick baby quilt. Continue to 22 of 80 below. From Rafta: My son and his wife are expecting their first baby and they live in Florida so I thought the fish theme would be appropriate. Continue to 23 of 80 below. This tractor patterned quilt is perfect for the little farmer your life! Continue to 24 of 80 below. Jungle animals and colorful stripes give babies lots to look at in this quilt design. Continue to 25 of 80 below. This jungle animal design is perfect for a quilt that is meant to be used for years to come. Continue to 26 of 80 below. From Sandra: My son finally married at 43 and became a daddy at age 44. He is on "Cloud 9," so I decided that the baby should be in the stars. This baby quilt is all flannel, so it's baby soft, with lots of appliques for the little one to play with. Continue to 27 of 80 below. From Theresa: This baby quilt is for my niece's new baby boy, Zackary. I used the baby genius panel and made the rest up as I went along. It is machine quilted in the ditch and I did a bit of free motion quilting in the four corners using the letters of his name. Continue to 28 of 80 below. Jungle Babies Quilt. Quilt by Tanya A. Animal patterns are a great addition to any jungle themed quilt. Continue to 29 of 80 below. From sheila go: This was the first quilt I made (20 years ago) for my children's' cot. I mostly used bits and pieces of fabrics I had around and just bought a few nursery fabrics. I saw the pattern in an old magazine and improvised the bumper, which has the same log cabin design on the back. As you can see, it has been washed countless times, but it has been well loved. Continue to 30 of 80 below. Ori's First Blanket. Quilt by Etti K.
This Earth-toned blanket is perfect for welcoming a new baby to his first home. Continue to 31 of 80 below. This baby quilt is perfect for a future fireman. Continue to 32 of 80 below. This colorful quilt is perfect for a zoo themed nursery. Continue to 33 of 80 below. From Afra: I made this quilt for a friend who tried for six years to have a baby. Finally, she has had a little one named Jack, and he is her star. Continue to 34 of 80 below. This charm square quilt proves floral prints aren't just for girls. Continue to 35 of 80 below. This country quilt works great for either gender. Continue to 36 of 80 below. 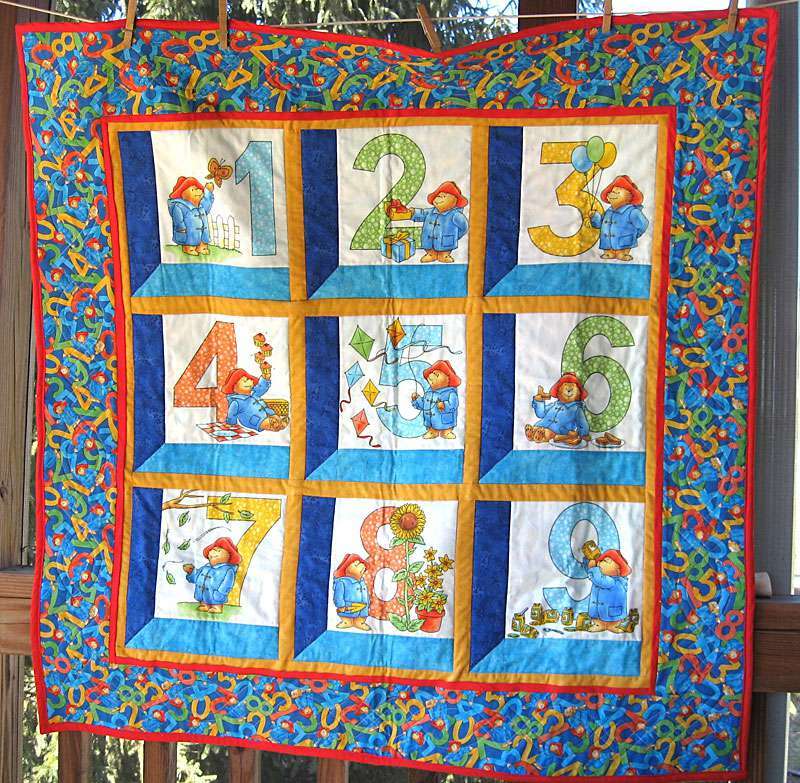 From Tammy: This baby quilt has 40 squares, 20 of which are hand embroidered with a different nursery rhyme. On the last square, I embroidered the baby's name, weight, height and the date the baby was born. Continue to 37 of 80 below. These bright colorful patterns are sure to catch any babies attention. Continue to 38 of 80 below. From Charlene: I bought the pattern for the quilt's embroidered block because I love Redwork/Bluework. So when I got word of a new baby born to one of my nieces, I decided to make it. I added the string blocks in blue. Ronan's brother does not like anything "girlie" or pink so I had to make this a 'boy' quilt. Charlie doesn't know, but there is a little bit of pink in those blues. Continue to 39 of 80 below. This challenging quilt was based on a popular 70's design called Puff or Biscuit. While this quilt turned out adorable it's a heavy quilt which might not be suitable for all environments. It makes a great crib cover for warmer climates. Continue to 40 of 80 below. From Laura: As a lover of the book Brown Bear, Brown Bear, What do you see?, I knew this fabric panel would make a cute quilt. I used up bright scraps from another ​quilt and put it together in a weekend. Continue to 41 of 80 below. This quilt alternates a sweet teddy bear fabric with pastel pinwheels that make it perfect for a little boy or girl. Continue to 42 of 80 below. From Corynne: I make a lot of baby quilts, yet have trouble finding patterns that are suitable strictly for boys. So when I came across this baseball fabric (my fave sport) I just had to use it. Hopefully, it will go to a future baseball player. Continue to 43 of 80 below. From Annette: Scott requested bright colors for his quilt, with royal purple as the main color. He also wanted pockets on the quilt. The yellow and red flying geese units are 3-D, with little pockets on each side. The long, red kite shapes are also pockets. There's a curvy green 3-D part too, just for fun. A book pocket on the center of the right side blends in with the purple background. Continue to 44 of 80 below. From Sandi: I made this quilt for my first grandson. I wanted to make a Teddy quilt because I had made a sleeping teddy quilt for his daddy (my youngest son) when he was little. Continue to 45 of 80 below. From Nancy: This quilt was made for my newest grandson, Jamie. I started with the embroidered blocks and decided to incorporate the log cabins. The size is 54 x 60. I used flannel backing and 100-percent cotton batting. Continue to 46 of 80 below. This crib size crazy quilt includes machine embroidered rubber duckies. Continue to 47 of 80 below. From Lisa: This quilt measures 52" x 52". Both machine stitching and handwork were used to create this wonderful gift. After 72 hours on the quilt, I was hooked. I have just completed my fifth quilt in assorted designs and sizes and can't wait to begin cutting again. Continue to 48 of 80 below. From Susan: My grandchildren love bugs of all kinds, so I made them each a small watercolor quilt. I added butterflies, ladybugs, ants on an apple core, beetles, bumblebees, and dragonflies. I also added yo-yo flowers and additional ribbon roses of yellow and red. Hidden in the watercolor squares, I embroidered each child's name so they could find it and also identify their doll 'blankies'. Continue to 49 of 80 below. From freeman or: I made this quilt for my 20-month grandson for Christmas. I added a 2-inch strip of sky above the sails as I wanted some blue above it. The quilt is about 62" by 74". Continue to 50 of 80 below. From Bea: I found this great panel with all kind of vehicles in wonderful colors and knew at once that this would be something for my younger grandson. As you can see, all the smaller panels were used at the ends of the quilt, to make it longer. There were 10 different panels (all the small ones went into the borders), and I had one big panel left, which made a nice little cushion. The rest of the fabric came from my stash. Continue to 51 of 80 below. From Yoga: My sister who lives in The Netherlands first grand baby arrived and I wanted to make a baby quilt for her. I was told they do not like soft colors so I chose this bold fish pattern and vibrant hues for the panels. Continue to 52 of 80 below. From Jen: This applique quilt was made for my friend's son. Each letter in this ABC quilt represents something special about him and his family. Continue to 53 of 80 below. From Enid: Animal Crackers is the first quilt I made. I saw the pattern and knew I had to make it for my first grandchild. I spent all winter on it and hand quilted it on a frame I made from furring strips. Continue to 54 of 80 below. From Stephanie: I made this adorable quilt for my son who is obsessed with anything with wheels. He loves it. I found him cuddled up or playing with it on the floor twice before I finished. The quilt has 15 trucks, road signs, and a traffic light inspired border. The backing fabric is an adorable cityscape I found a year before I found the pattern for the trucks, but I took one look at it and knew my little guy just had to have it. Continue to 55 of 80 below. This is a great pattern for anyone with an odd assortment of panels to use. This ensures that every quilt is unique and sure to catch the babies eye. It makes a great wall hanging too! Continue to 56 of 80 below. From Carol: This quilt is based on my grandson's favorite movie that he introduced me to and allowed me to watch with him about 1,000 times in one week. The quilt measures 60" x60". Continue to 57 of 80 below. Scrub Scraps Baby Quilt. Baby Quilt by Barbara W.
This quilt was made with repurposed scraps from scrub tops. Perfect for a nurses baby! Continue to 58 of 80 below. From Afra: I saw a picture of this quilt in a magazine and knew instantly that my Grandson would love it. The quilt is machine pieced and machine appliqued and measures 49" x 58". I also tried some crazy quilting for the first time and was quite happy with the results. Continue to 59 of 80 below. If you're looking for something a little different from the regular pastel blues this chess inspired quilt is sure to fit the bill. The back is done with a background of black and white chess pieces. Continue to 60 of 80 below. This island getaway inspired quilt is sure to send its owner off to sleep with dreams of paradise. It's great for the little sailor in your life. Continue to 61 of 80 below. From Ann: My 8-year old grandson wanted a quilt with sailboats. He even gave me the name to put on the sailboat, which I did. It is a double size quilt and I hope he enjoys it for the rest of his life. Continue to 62 of 80 below. This masculine colored quilt has a furry fleece backing making it a great quilt that can be used for a boys whole life. Continue to 63 of 80 below. These quirky bunnies liven up this baby blanket. Continue to 64 of 80 below. Honu is the Hawaiian word for turtle. This machine appliquéd quilt is great for any island baby. Continue to 65 of 80 below. Ivquilter: This quilt came about because one of my friends had a baby recently and her theme was Cookie Monster. The quilt measures 43 x 55, and I've incorporated Minky fabric on the backing to give it a plush feel. I've appliquéd Cookie Monster to 6-1/2" squares and stitched in the ditch on the front. Continue to 66 of 80 below. From Pauli: My grandson loves BMX bikes and he asked me to make him a quilt. I found BMX fabric and had to come up with a pattern. The quilt was lacking something. My grandson helped me come up with the flags in the border. My friend came up with the idea of using the snowball block along with the BMX print. Continue to 67 of 80 below. From D: I am a beginner and didn't really know what I was doing, but with our grandson expected any day I wanted something special for him. My husband was throwing out some old flannel PJs and I thought, why not put them to use? I looked up online how to make a quilt and found this site. I just began cutting and sewing together squares and then put them together. I thought a pocket was a great touch to put a favorite rattle in and then added Grampa's hand print with washable non-toxic fabric paint. The quilt is 40" x 50". Continue to 68 of 80 below. Alex's I Spy Quilt. © Donna D.
From Donna: My niece started making I Spy quilts for her grandchildren so I decided to try it, and now I don't want to stop. Continue to 69 of 80 below. From Eyeztodiefor10: My grandson, Aydin, just loves the TV show "Bob the Builder". I bought pillow panels on eBay and took them apart, fussy cutting the smaller characters in the pillow border. I made blocks showcasing the little characters and featured the main two pillow sides centrally in the quilt. I bought the dark blue fabric with construction vehicles and used this on the front to fill gaps and also as a backing. Aydin loves this! Continue to 70 of 80 below. Looking for something to make with your fat quarters? Try this adorable bear quilt. Continue to 71 of 80 below. From Jackie: This is my first attempt at making a quilt "on point". I had the fabrics and didn't yet know what I wanted to do with them until I came across this pattern in The Quilter magazine. Continue to 72 of 80 below. From Jackie: Originally the design called for two girls and two boy bears and I changed it to suit my taste. Instead of all the appliqué called for in the quilt, I opted to use a Sharpie marker to make the embellishments. The ears are fun because they are 3D something you wouldn't normally find in a traditional quilt. Continue to 73 of 80 below. From Peg: This is a signature quilt for a baby shower, a very easy pattern for beginners. I used a flannel material on the back and put loops on the quilt so you can hang it instead of using it in a crib. I quilted in the ditch then quilted radiating hearts all around the 4 white edges. Continue to 74 of 80 below. Fat quarters and appliqué vehicles are a great way to make a unique baby blanket. Continue to 75 of 80 below. From Tara: This is my third quilt. It measures approximately 50 x 50 inches, with nine log cabin blocks surrounded by borders. The block piecing was free form. Continue to 76 of 80 below. From Melissa: This is a crib size quilt. It's a simple, block style quilt, and I used t-shirt transfer paper to put the photos on the fabric. Continue to 77 of 80 below. From Momofll: I saved the leftover and scrap fabrics from my daughter's wedding dress. It was made from a crepe-backed satin and used them to make this baptism quilt for her when her first son was born. It is all satin, with the crepe side turned to the front for contrast. The fabric raveled terribly so I used a simple design and serged the seams. Continue to 78 of 80 below. Dee in Tex: I had just bought Carol Doak's 40 Fabulous Paper Pieced Stars and wanted to try it out a baby quilt for a friend's first child. This was the result. The mother has since told me her son uses it at daycare as his favorite quilt, and she can always find him with it at nap time because it's so bright. Continue to 79 of 80 below. From Cheryl: I used a pattern from an Ami Simms book to make this I Spy quilt for my cousin's child. Continue to 80 of 80 below. From Pamela: I made this quilt for our friends who had twins boys and chose fun summertime colors for the fabrics.